There is perhaps no tool more effective or pervasive right now in the world of eLearning than the tablet. Mobile phones and laptops are still useful of course, but businesses are increasingly turning to iPads and other types of mobile tablets to deliver training and development content, thanks to their portability, convenience and popularity. You may ask yourself whether or not designing eLearning becomes different when focusing on a tablet-based delivery format, and the short answer is yes. Below are simple rules to guide you through the process of creating content that works well and functions ideally on an iPad or any tablet. Just because you can design learning for a tablet doesn’t mean this is the best way to deliver all of your content. You may want to only enable certain modules or portions of your content for a tablet. Before you truly begin designing, think about what’s going to work best in this format and what may be better left to computers or mobile devices. For example, you may only want to have quick references be part of your tablet learning, with the more comprehensive information being delivered via a computer. 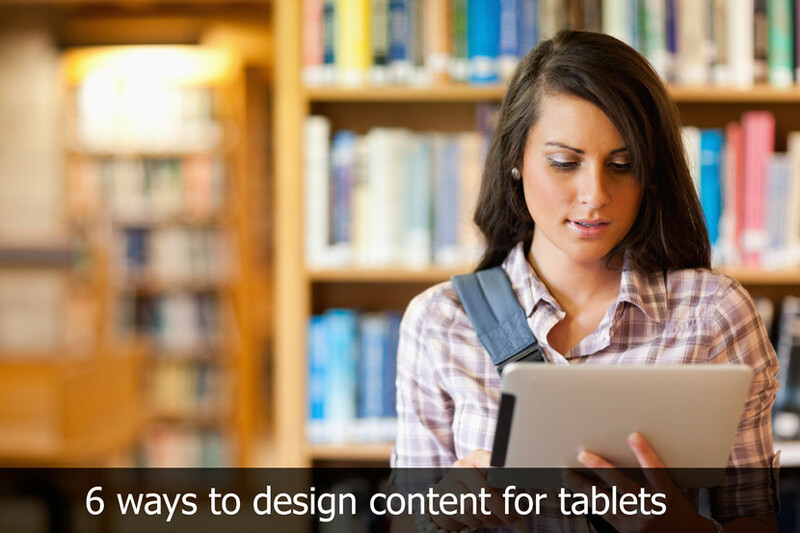 When developing content for tablet delivery, always design with the user in mind. Think about how your learner is most likely to be viewing and using the information, and design with convenience in mind. Also think about what’s intuitive to a learner. Ultimately using a tablet as a learning delivery device is going to be focused on convenience and simplicity, and if you stray from these concepts during the design process your learner isn’t likely to glean much value from the content. Size is one of those technical elements of instructional design that really comes into play with tablets. Even the most advanced tablets aren’t going to have the same level of resolution you’re going to see with a laptop or a desktop, so you may find an image that looks great on a traditional computer that simply doesn’t work on a tablet. Much as is the case with designing mLearning, with tablets the design process is all about touch. Users work through the content using buttons, arrows and other intuitive elements so don’t include learning content that’s going to require them to enter a great deal of information via a keyboard. It’s not realistic. Instead, the user should be guided by simple one-touch processes throughout. That should be the central focus of your navigation design. Both tablets and smartphones may mean issues with connectivity can arise, particularly for users who are on-the-go, such as a sales team. With this in mind, develop tablet learning that doesn’t require the downloading of large files or videos because this may not be possible in locations where Internet connectivity is an issue. If you’re going to be designing training and development for use on a tablet, go ahead and add collaborative elements as well. The tablet works well as a collaboration tool and by combining tablet usage with social and collaborative learning elements, you’re going to enrich the experience of the learner and take advantage of some of the innovative offerings of these mobile devices. These are just some of the tips that can help you develop and implement a robust approach to training employees via a tablet. As we head into 2015 we’re likely to see tablets become even more universal in the workplace and they serve as a valuable tool to reach employees anytime, anyplace.